Our Security Rule Pro™ Training modules include our existing Security Rule Training and Security Rule Audit Training (a combined value of $428.95). 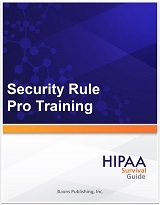 In addition, this product includes our Security Rule Training for Clinicians. However, the Security Rule Pro™ Training product adds a total of sixteen (16) new modules in order to be consistent with our micro learning strategy. Specifically, Security Rule Pro™ Training adds six (6) Concept Shorts and ten (10) Micro Shorts to make this training the most comprehensive Security Rule training product on the market. Each primary concept within the Security Rule: (1) Administrative Safeguards; (2) Technical Safeguards; and (3) Physical Safeguards is captured in three distinct Concept Shorts. For each Concept Short, there are a number of Micro Shorts that are provided to further illustrate the concept. Our Security Rule Pro™ Training represents the quintessential Security Rule training honed over a decade of teaching the Rule to thousands of customers, newsletter subscribers, and webinar attendees. This training is no longer solely for compliance officers and counsel; it can be used to introduce your entire workforce to the Security Rule. A Rule that becomes more important each day with what appears to be the daily occurrence of data breaches within the healthcare industry.